Flower essences, although not exactly the same as homeopathy, use energy as a way to treat different problems, both in people and animals, including man's best friends. Flower essences work very well on dogs, especially those with emotional or behavioral problems, although there are also some essences that can help treat certain physical problems such as arthritis, and skin problems. Since flower essences do not cause any adverse side-effects (the worst that can happen is that they have no effects on the pet), it doesn't hurt to try them out on your pets if needed. 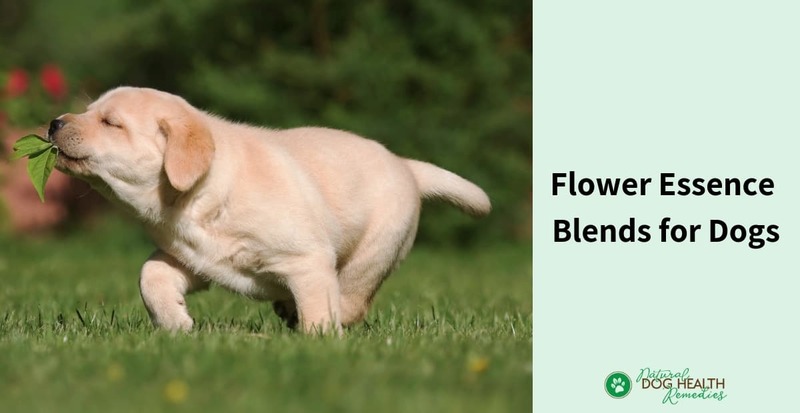 This page recommends some common and effective flower essence blends specially concocted for pets to help them overcome numerous common emotional, behavioral, and physical problems. This Rescue Remedy is make up of a combination of five flower essences that act synergistically to calm stress and fear. It is therefore an invaluable addition to a dog's first aid kit. It will often revive animals that are in shock, such as immediately before the onset of a seizure, or after a traumatic event. It has definitely saved many animals and is totally safe. Pet Essences Loneliness / Home Alone : This remedy is excellent for dogs who are suffering from separation anxiety and who are always "clingy" and who have difficulty adjusting to new environments. Pet Essences Calming Solution : This blend can be used in situations when your dog just cannot relax or calm down easily. Dogs who are out of control, hyperactive and high strung, overly possessive, demanding, or attention-seeking can benefit from this blend. Pet Essences Emotional Stability : Our pets can pick up tensions from us. If there is tension in the house or if you notice that your dog is somewhat depressed, this flower essence can help stabilize your dog's emotions. Pet Essences Travel : Do you have problems getting your dog in the car? Does your dog whine and cry all the way during a trip? Does he suffer from motion sickness? If so, this essence can help calm down your dog and can make your trip more pleasant and stress-free! Pet Essences Anxiety / Fear : This remedy is excellent for dogs who have great anxiety, such as noise anxiety (e.g. thunder and storms). It can also be used for trips to the vet, new situations, getting adjusted to new people and animals, fearful cowering and hiding, etc. Pet Essences Arthritis : If your dog suffers from arthritis, you can use this remedy to help relieve stiff, sore, achy joints and muscles and arthritis type symptoms. Pet Essences Digestion / Assimilation : This remedy can improve food digestion and assimilation of nutrients. It is useful for picky eaters, or dogs suffering from constipation. It can also help neutralize pollutants in the environment. Pet Essences Skin Irritation : If your dog is suffering from skin irritations caused by bites, allergies, yeast infections, or anxiety, and is constantly scratching, biting, or licking himself, try using this remedy to ease the irritation.